Regime Superman has finally cornered the Batman, and has him at his mercy. However, Batman is able to stall Regime long enough to allow Batwoman and Batgirl to complete their mission and bring in the Justice League from an alternative dimension. In doing so, Batman is teleported away to safety, leaving Regime Superman back at square one... and Injustice at an end. Story - 2: Three years of storytelling culminate in a flaccid, flagging tale that means absolutely nothing to those faithful to the Injustice storyline. Ad infinitum it has been said that if a reader wants the full story, the cut-scenes for the video game need to be viewed. If those scenes aren't taken in, one could simply wait for the sequel to Injustice and continue on without the knowledge provided by the aforesaid. There are choices to be had at, despite the seemingly finite chapter that's been delivered. There is very little to continue onward for, however, other than a desire to keep on keeping on. 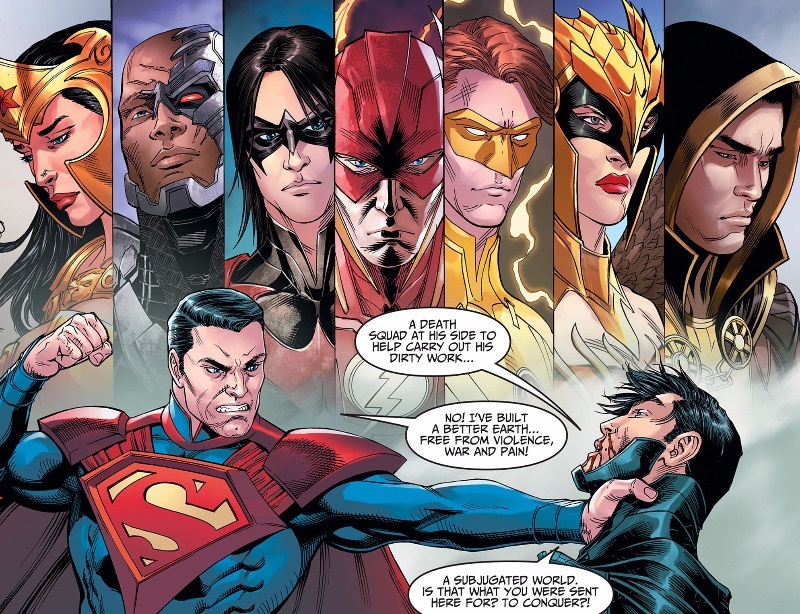 Injustice: Gods Among Us came from a revolting place: the idea of whom would win in a fight, Superman or Batman, and the DC Universe proper was overturned to facilitate it. Superman was made into a murderer. Wonder Woman followed. Batman compromised every principle he possessed to defeat Regime Superman, and failed, making those concessions trite and hypocritical. While Batman felt that Regime Superman's actions were grossly wrong, he was willing to work with Harley Quinn, the woman who assisted in killing Jimmy Olsen and Lois Lane. When either Batman or Regime had the opportunity to end the conflict permanently, it was never done. 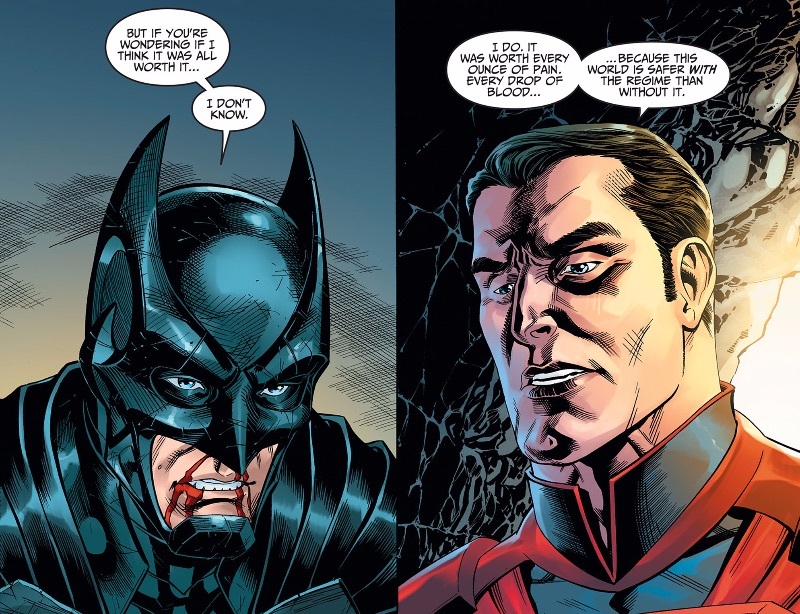 Even in this finale, Regime Superman talks and debates with Batman, rather than simply kill him and be done with it. The boilerplate writing is only matched by the resounding apathy of Injustice's readership for anything resembling consistency. Injustice sold well, and that has been the bottom for over three years. Injustice presented a format that was too attractive to resist for readers that were exhausted with DC Comics' shenanigans in using their superheroes. It was an alternative universe where familiar superheroes could act out of character with impunity, and served as an Elseworlds tale of sorts for long-time readers. 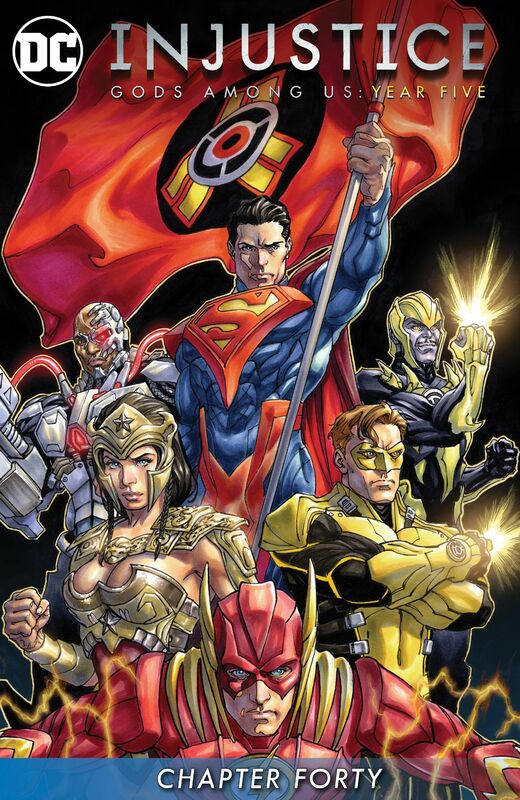 It was also an easy in for those familiar with characters like Superman and Green Lantern, but were not going to be bothered with reading "canon" stories, even if DC's New 52 initiative was in full motion at the same time. Here was a no-nonsense Superman, unfettered by morality; here was Batman boiled down to a catch-phrase; here was Wonder Woman at her blood thirsty best. The great irony is that Injustice, for all of its poor handling, presented the DC Superheroes with more consistency than the canon universe. Injustice was, and still is, a sophomoric trifle blended into bland pablum... but it was reliable. It may have been wastrel, but it was reliable wastrel. DC's New 52 initiative was so damaging, the Superman for a new generation had to be replaced by "your father's Superman". Injustice? It's going for another match after 15 rounds of rope-a-dope. I may not have enjoyed the series, but you have to admire, at the very least, it's success with such dysfunctional characters, when DC couldn't sell the proper iterations at the same time. Art - 4: Serviceable, is the best definition for the art on the series overall, but it would have been wicked to see Miller turn in something more than that for the finale. Cover Art - 4: Another great composition. The detail on the flag for the wind blowing even extends to Yellow Lantern's hair.